Later, he writes: ' 'Samhain' is the name of the holiday. There is no evidence of any god or demon named 'Samhain,' 'Samain,' 'Sam Hane,' or however you want to vary the spelling.'" LittleBoots writes: "are you ready for the FUN?!? here is cover of hot chip's ready for the floor, its not exactly perfect but best i can do on the amazing tenorion!!!" "The truly MODERN composers," I said, "program the presets into personal music devices. Real-time creative 'interactive' music is the future of composition." Todd was giving the keynote, said he had to go. Rundgren talked up his new 'interactive' project, a jukebox CD of premixes, all the same song. At Q&A, a young man asked, "But Todd, when will I get to JAM with you?" Greenspace - Los Angeles Times: "Bottled water isn't necessarily any purer than the water you get from your tap, it's just more expensive, according to a report released Wednesday by a Washington, D.C., nonprofit research group. The Environmental Working Group sent samples of 10 major bottled-water brands to the University of Iowa Hygienic Laboratory. The results: 38 low-level contaminants turned up in the water, with each brand containing an average of eight chemicals. Disinfection products, caffeine, Tylenol, nitrate, industrial chemicals, arsenic and bacteria were detected. Two brands contained disinfection products at levels that exceeded California's bottled-water standards"
and that doesn't even get into how bad the bottle itself can be! I think word is getting around, though, as I see at our beach-side no-pipeline resort-area grocers the bottled water is selling for record low-prices and still sits stacked up on skids in the ailes. Florida Real Estate For Sale: "21+ acre park-like paradise, lush landscaping consisting of many ponds, lakes, hundreds of palm trees, various fruit and flowering trees, many large old, oak trees, two bridges and a large deck cantilevered over a lake. Ten buildings; hurricane resistant, fire resistant, termite resistant, concrete and steel buildings, 5 are domes, 3 homes, 1 office, 2 equipped shops, very large spa, 4 wells, 3 septic tanks. A Perfect Country Get Away..."
For those who may be inspired by the film "Zeitgeist: Addendum", here's the one-year-later The Venus Project futureworld research facilities, all yours for less than the price of your average Sauble beach-biz location! Ideal location for reinventing human existence, would also make an ideal lair for an evil genius. RadioDirectX.com: David Valdez writes "So far it seems like (Canadian arts promoters) Radio DirectX has been a very good investment for me. As independent Jazz artists how else are we going to get international radio airplay? I've heard plenty of horror stories from Jazz musicians who hired PR agents for $1500 per week and only got a couple of CD revues in obscure Jazz rags. We need to get our CDs out of the boxes stacked in our garages and out into the world for people to hear. We also need press quotes that rave about our masterpiece recordings, and it's nice if those quotes are from a radio stations in Australia, France or Poland (or even Belarus) rather than from a CD review in your local Jazz society newsletter." one of the disappointing aspects of most all the mp3 hosting sites is how poorly they market submissions to people who matter; Valdez thinks he may have found a workable alternative for the independent seeking global exposure, and while expensive to play, their clients include Billboard, the Junos, EMI, and Sony/BMG, so the potential for payoff appears to be worth the investment risk. Sugar Chile Robinson appeared with Count Basie on television, performed with Lionel Hampton and played for President Harry S. Truman at the White House. In 1946 he appeared in the Hollywood movie No Leave, No Love with Van Johnson and Keenan Wynn. Robinson continued to tour Europe and America until the mid-1950s when he opted to pursue an academic career. He earned a Ph.D. in psychology from the University of Michigan. How old do you need to be to play piano? This clip is the oldest footage of Frank "Sugar Chile" Robinson, at the time, 5 years old. Colonel Bleep was the first color cartoon ever made for television. It was created by Robert D. Buchanan, and was filmed by Soundac of Miami. The show was originally syndicated in 1957; 104 five-minute episodes were produced, less than half are known to survive today. Colonel Bleep, an extraterrestrial lifeform from the planet Futura, protected Earth with the help of his deputies, Squeek (a mute cowboy puppet boy) and Scratch (a caveman of great physical strength who was awakened from a sleep of several thousand years by an atomic explosion). "... and trouble ANYWHERE in space is the concern of the Futura Interplanetary High Command ..."
just so you know I come by my nuclear-proliferation opinions honestly, I would linger at home that extra fifteen minutes at lunchtime to catch the Colonel on the cross-border TV before heading back to school. Who better than a selfless Futuran to teach the dangers of atomic power? part 4 of 6: Saturn: "Sun Ra's Saturn revisited Registration of the Clazz Orchestra concert at the ZXZW Sun Ra Festival, sep 19th, 2008. Tilburg, the Netherlands. The Clazz Orchestra played music by Sun Ra, and worked with the resident Sun Ra Arkestra, now lead by Marshall Allen. Neurophilosophy : "piano training involving playing musical sequences leads to more reorganizational changes in the brain than does training involving listening alone. They also demonstrate that just 2 weeks of cross-modal musical training enhances connectivity between the sensorimotor and auditory regions of the brain. 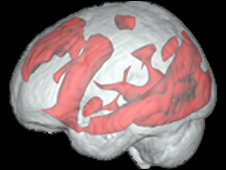 Their findings are published in the current issue of the Journal of Neuroscience." More evidence that OHIP should be paying for music lessons. To be fair, though, they also found it was neuroplastically ok to just LISTEN to music, provided you DANCE while you do.